Raised on a musical diet of Billie Holiday and spiritual juice, San Diego native Andra Day is blossoming into her own with her freshman album, Cheers to the Fall. Released on Warner Bros., the 13-track set helmed equally by producer/songwriter Adrian Gurvitz and Raphael Saadiq puts Day squarely in the heartland of Amy Winehouse extravagance. Listen intently to the grooves and to some of the heartbreak within the lyrics and you’re almost transfixed into an adventure that flows like a posthumous Winehouse disc. For example, “Only Love” sounds like a Back to Black vault track as it escalates to soulful pop heaven using glorified strings and 007 motifs. But, with Rihanna-esque youthfulness and a peppy jazz vocal style akin to Melanie Fiona, Day seems to distinguish herself a little bit from the late Brit icon. Much of the music aboard Cheers to the Fall dances with euphoric arrangements and inoffensive soul pop. “Not Today” plays like a dreamy Carpenters’ adventure. Both “Forever Mine” and “Goodbye Goodnight” are serenading in a sea of doo-wop and jukebox slow dancing. On “Gold,” Saadiq’s throwback production flair – a tribute to real instrumentation and the invention of ‘60s Motown – takes precedence and gives Day something bold and sophisticated to play with. The diary-like lyrics are also instrumental to the song’s strong favorability, where she compares a past ex to a teacher and takes the endured pain as a lesson learned: “I see the reel/now it’s real to me/I gave up gold for grains of sand/slipping through my hand.” There’s also “Rearview,” a song that’s screaming for a single release as it drips with Adele gorgeousness, a meaningful storyline and smart pop radio magic. Day stays in a lane similar to Winehouse and the impressive list of UK soul exports like Adele and Sam Smith, artists who’ve made heart-worn tales their preferred testament of song. She hints at domestic abuse on “Gin & Juice (Let Go My Hand)” and end-of-the-road ultimatums on “Honey or Fire.” Even when “Mistakes” conjures feel-good disco meets Philly soul, she’s still affixed with the blues. “And I promise I won’t mess it up this time,” she begs for a second chance at love. The good thing about Day’s blues is that it’s not forever submerged in gloom or morbidity. On “Rise Up,” a song selected for the Netflix What Happened, Miss Simone? documentary, Day jumps into a spare piano arrangement that plays like an inspirational hymn. It walks the line of the typical John Legend ballad, especially as it marches upward to something just as transcendent as the Oscar-winning “Glory.” The closing title cut, which prominently showcases Saadiq’s guitar and bass skill, is also another account of learning from life’s lessons and making lemonade out of lemons. 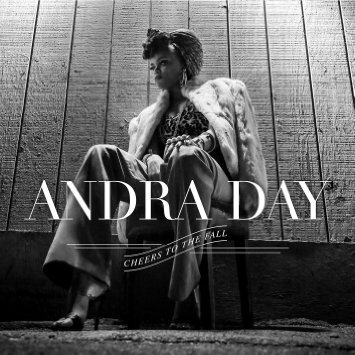 “Cheers to the Fall” in particular also displays a type of epic belting that’s much needed in modern R&B. Although Cheers to the Fall slacks a bit by being too slow-paced at times and is overly steeped in a melancholic lounge mood, Day is still refreshing to the ear. She’s armed with good songs draped with solid crystalline production. She’s well on her way to prominence, if only giving the blessing of radio. Recommended.